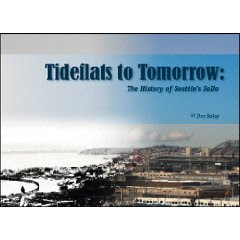 Dan Raley, local author and longtime reporter for the Seattle PI, recently published a book titled Tideflats to Tomorrow: The History of Seattle’s SoDo. By highlighting South Downtown’s widely unknown past, author Dan Raley creates a riveting account of SoDo’s one hundred and fifteen year transformation from a “big salty puddle” to the bustling industrial center it is today. As for SoDo’s future, Raley looks to local developers like Greg Smith for insight. “Developer Greg Smith envisions a section of SoDo becoming one of Seattle’s more progressive links to a future way of doing business. He has unveiled plans to create a “green” auto row along 6th Avenue South; […] He has met with alternative energy automakers in Silicon Valley. He has welcomed gas-saving electric bikes, motorcycles, and Segway scooters to join in this environment.” Quoting Smith, he continues: “We’re a progressive city, a ‘green city,’ and we should be leading the charge. We’re really the only place in the city that could do it. You can create tax revenue and it is win, win win. We have engineers who built the Dreamliner, the most fuel-efficient jet, and Pac-car, which builds fuel-efficient trucks. We have the brainpower here and we have the opportunity to create new industry in Seattle”(Raley, 121). If you would like to purchase a copy of his book, click here.